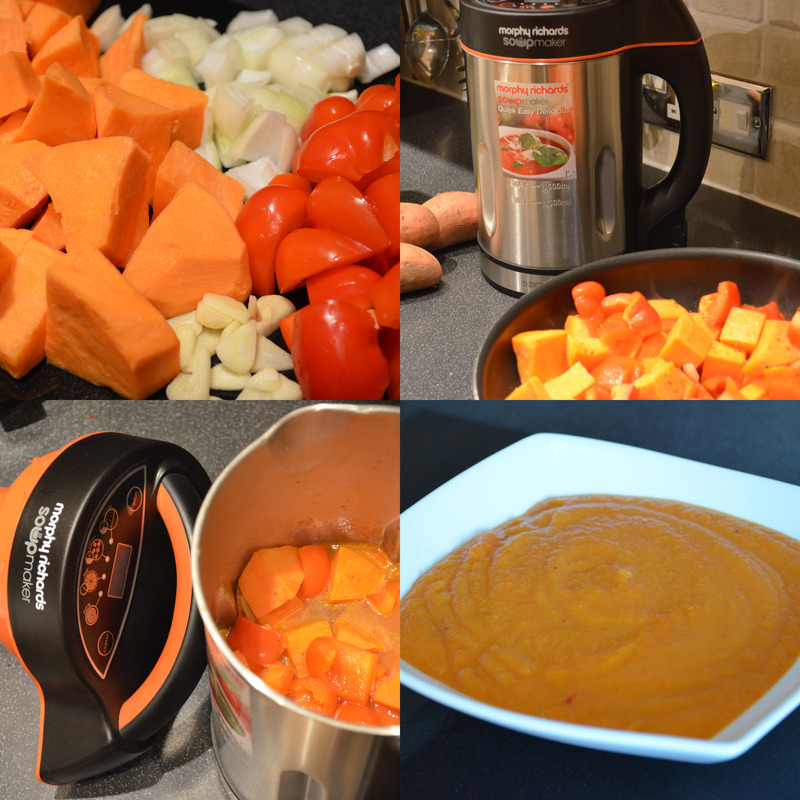 So I made this delicious soup using the New Morphy Richards Soup Maker with Serrator Blade. It has two separate parts, a main ‘kettle’ like jug and a lid with an attached Serrator blade – the Serrator blade stays sharper up to 12 times longer than a standard blade. There are three settings on the Soup-Maker, Smooth, Chunky and Juice. Smooth is an ideal setting for soups requiring a smooth consistency. Chunky only heats and doesn’t blend for rustic soup recipes, but there is a blend button for manual blending if you require an in-between texture. Juice is for smoothies and milkshakes. For more information, read Top 10 Reason to Buy a Soup Maker. Start by preparing all of your veg. De-seed and chop the red pepper into roughly 2 cm chunks, peel your sweet potato and cut to a similar size. Dice your onion fairly small, finely chop the chilli (unless you’re being lazy like me!) and slice up the garlic cloves. Sautée the onion, garlic & chilli in a wok with a splash of oil or knob of butter for 2-3minutes, then add the red pepper, sweet potato, paprika & cumin for a 5 minute fry up on a medium to high heat. However, I have tried it without doing this and it still tastes great – healthier also. I guess it’s just engrained in me to sauté first! It’s up to you what you do, depending on your time restraints and health preferences. Also, the onions need to be chopped relatively small if you are not frying or roasting them first. We also have the Sautee and Soup Maker which does that for you! Next, remove the lid of your soup maker & make sure it is not plugged into the mains. Carefully transfer all of the ingredients in to the soup maker jug in between the minimum and maximum lines indicated on the inside of the kettle jug. Prepare 500ml of hot vegetable stock (I used one of those nice vegetable stock pots), and slowly pour over the ingredients in the soup maker. Again, making sure you are between the min & max recommendations. 500ml may be too much if you are not filling to maximum so just pour in enough to cover the vegetables. Finally, press mode to select the ‘smooth’ setting, which is 21 minutes long, and leave the soup-maker to do its thing! There’s no need to check back on it at all. When done, remove the lid, season to taste and voila, your soup is ready to serve! cooking, Cooking Ideas, kitchen, Kitchen Appliance, Morphy Richards, Recipe, Soup, Soup Maker. Bookmark. This is really nice but I would recommend putting in more chilli as you can barely taste it with just one. Thanks for the recipe best soup I have had out of a soupmaker. My is a Salter and I cooked it on the puree setting. It came out like your photo. I like it thinner so added cold water and pressed the blend. I had taken the seeds out of the one chilli I used. Could not really taste it so added about half teaspoon of chilli flakes, salt and pepper to taste and pressed blend for a short time. Love love love this recipe! Can’t get enough of it!